Moses the Black was a 4th century African saint. He has some sweet aliases, too: Abba Moses the Robber and Moses the Strong. 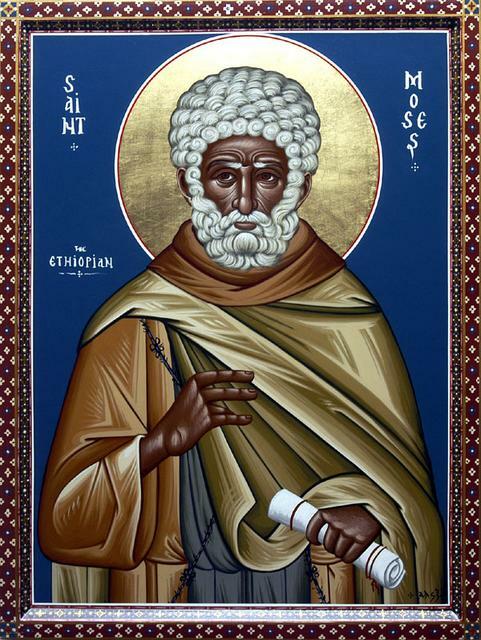 As in the image above (which is from here), he is also known as St. Moses the Ethiopian. St. Moses the Black was a former gang leader, murderer, and thief in ancient Africa. However, he became a model of transformation. His is one of the most inspiring stories among the African saints. Moses, an escaped slave, was the leader of a group of 75 robbers. He was a large and powerful man, who with his gang terrorized the entire region. Moses was transformed after he and his group attacked a monastery, intending to rob it. He was met by the abbot, whose peaceful and warm manner overwhelmed him. He immediately felt remorse for all his past sins, sincerely repented, and begged to remain at the monastery. Moses was tortured by his past and for years was tempted to return to his old ways. One day, as he was confessing his sins to St. Macarius, it was reported that an angel appeared with a tablet full of his sins. As he confessed, the angel began wiping the tablet clean. The more he confessed, the more the angel was said to have wiped, until by the end it was completely clean. After meeting St. Macarius and St. Isidore, he completely left his old ways behind him and became a monk. Later, St. Moses was ordained to the priesthood — a rare honor among the Desert Fathers– and founded a monastery of 75 monks, the same number as his former group of thieves. He was known for his wisdom, humility, love, and non-judgment of others. Once a brother had been caught in a particular sin, and the abbot asked St. Moses to come to the church and render judgment. He came reluctantly, carrying on his back a leaking bag of sand. When he arrived, the brothers asked him why he was carrying such a thing. He simply said, “This sand is my sins which are trailing out behind me, while I go to judge the sins of another.” At that reply, the brothers forgave the offender and returned to focusing on their own salvation rather than the sins of their brother. In 405 A.D., at age 75, St. Moses suffered a martyr’s death when his monastery was attacked by a group of barbarians. He is remembered on the 28th of August. Today he is considered the patron saint of African Americans. More on Moses the Black can be found here. Abba Moses the Robber?? How cool. What a great story – thanks for posting this and the others about All Saints Day. My pleasure! Yes, that’s a pretty awesome nickname. Especially seeing “Abba” and “Robber” juxtaposed like that.